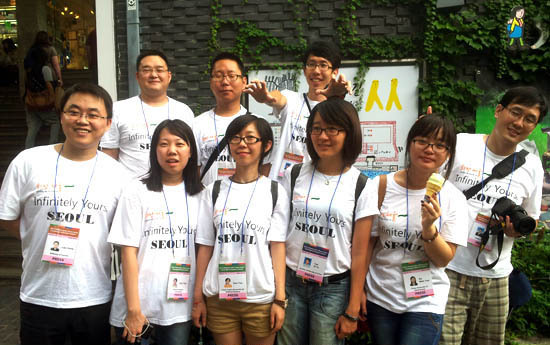 Twenty-two Chinese student reporters from ten universities in Beijing and nine universities in Shanghai visited Korea to experience Korean culture on August 16 under the invitation of the Korea Foundation for International Culture Exchange (KOFICE). The student reporters enjoied the latest Korean culture in Myeongdong, the mecca for the young Korean generation, and try their hand at making traditional kimchi. They also visited the essential tourist destination Insadong where traditions and modernism coexist, and sample Korean cuisine. the student reporters as well as Chinese reporters in Seoul holded a discussion session with the mayor of Seoul. The meeting will generate honest, in-depth talks on Seoul administration, Korea-China relations, Hallyu and youth culture. There will be a special section for Chinese reporters who reside in Seoul to share what they’ve seen and experienced of Seoul. The student reporters will also have a chance to get direct answers from the mayor on any questions that they have about Seoul.